Our Coanda flare tips are a vast improvement on others available on the market. We have worked with numerous end users to extend the service life of their Coanda flares and can offer a selection of enhancements that will provide the operator with excellent flare life time to compliment the technical advantages of this type of flare tip. The tip is specifically designed to achieve very low radiation and directional flaring whilst still meeting acceptable noise levels. They typically operate at pressures up to 5.0 barg, and provide a good reliable method of high pressure gas disposal whether by venting or flaring. Our Coanda flares provide the operators with a robust and reliable flare tip that will typically exhibit long life time. We can supply new bespoke flare tips or refurbishments of other OEM flares to suit the operator’s specific platform or site conditions. The standard flare tip body and cone section is fabricated in heat resistant 316L SS, 310S stainless steel, Alloy 330 or 800H materials. Upgrades to higher heat resistant materials are also available when the operating conditions are more onerous than normal. Our Coanda flares use the Coanda effect to entrain and mix air into the hydrocarbon gas stream. High pressure gas exits radially from the annular slot at the base of the tulip. It adheres to the Coanda profile and is directed through 90 degrees, entraining up to 20 times its own volume of air in the process. Flame initiation takes place just above the maximum diameter of the cone section, ensuring reliable ignition of the gas by external pilots. Smokeless, low radiation combustion is achieved without the need to introduce utility steam or air. 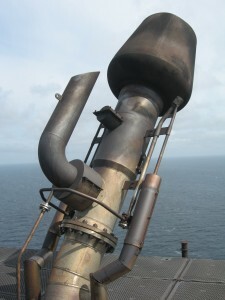 Please contact us for further details of how we can increase the life time of your Coanda flare tip.